The Department of Energy (DOE) is committed to moving to net zero energy homes by 2020. 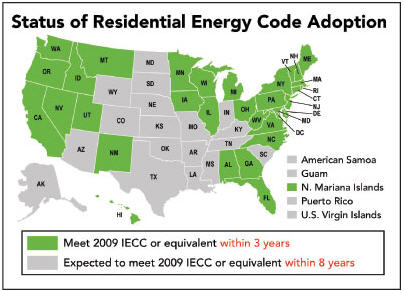 The first major step toward those goals is embodied in the 2009 IECC, which by various estimates is 12% to 15% more energy efficient than its 2006 predecessor. These changes not only move toward the DOEs goals for improving the code, but are beginning to make their way into state and local building codes. They will soon become part of the new standard practices for improving energy efficiency in most residential buildings. In so doing, they will create the need for new and enhanced inspections that require a higher level of testing expertise.